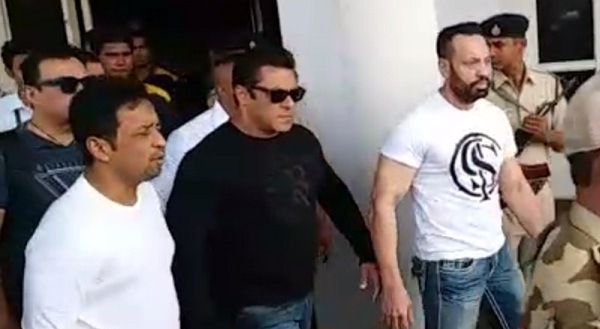 Jodhpur : Jodhpur CJM (rural) court on Thursday convicted Bollywood actor Salman Khan in the 1998 blackbuck poaching case, while others - Tabu, Saif Ali Khan, Sonali Bendre, Neelam - were acquitted. The quantum of sentence would be announced shortly. In October 1998, total three cases in connection with poaching and one under the Arms Act were registered against Salman. The 52-year-old actor allegedly shot two blackbucks in Bhagoda ki Dhani in Kankani village near Jodhpur during the shooting of 'Hum Saath Saath Hain'. Saif Ali Khan, Sonali Bendre, Tabu and Neelam were also present in the vehicle Salman allegedly used for hunting the endangered species protected under Schedule 1 of the Indian Wildlife Act. Salman was charged under Section 51 of the Wildlife (Protection) Act and others under Section 51 read with Section 149 (unlawful assembly) of the Indian Penal Code. The 'Dabangg' actor was in February 2006 convicted in the blackbuck hunting case, slapped a fine and sentenced to five years in jail. He spent a week in a Jodhpur jail before being granted bail. The Rajasthan High Court on August 31, 2006, suspended the sentence and ordered the actor to not leave the country without formal permission. The court, six years later on July 24, 2012, finalised charges against the actor and other accused in the four cases. On July 25, 2016, the Rajasthan High Court acquitted Salman of all charges in the blackbuck poaching case and said there was no evidence to prove that the endangered animals were shot by the actor's licensed gun. The Supreme Court on November 11, 2016, issued a notice to Salman on an appeal by the Rajasthan government challenging his acquittal in blackbuck poaching case. The apex court had agreed to fast-track the case. In January 2017, Salman Khan was acquitted by a Jodhpur court in the Arms Act case. The Jodhpur Chief Judicial Magistrate Court on March 25 under Jodhpur District Presiding Officer Devkumar Khatri had issued April 5 for the judgment in the 20-year-old case.